The Tune A Lite is a linear neon bargraph tube that was used as a tuning indicator in several radios during the early 1930s. Tune A Lites were made in both a two pin and four pin version, the four pin model is shown here. 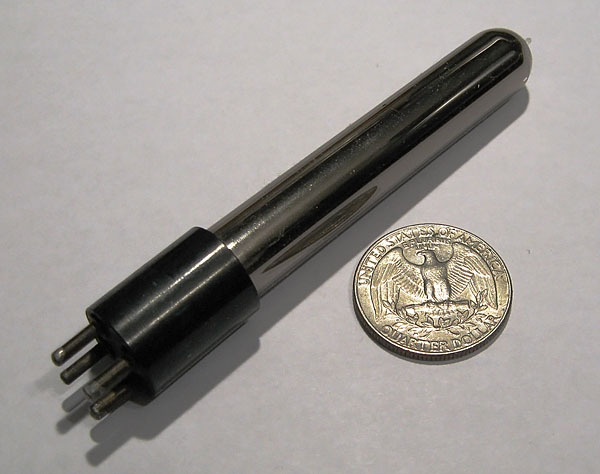 Four pin Tune A Lites include a keep alive electrode for faster striking as well as a T-shaped trigger electrode, which is used to detect that a station has been 'zeroed in' on radios with an automatic muting function. 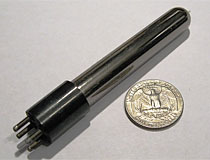 The trigger electrode runs parallel to the display cathode and is partially covered with a glass sleeve, which causes the trigger to only begin to conduct once the glow discharge has extended far enough up the length of the tube to bypass the sleeve, indicating the presence of a strong signal. The example shown here demonstrates the Tune A Lite's greatest weakness, its utter lack of durability. The thin cathode within the tube is extremely vulnerable to sputtering, and in this example the cathode has been completely dissolved and spread in a thin layer of silvering on the inside of the envelope. The Tune A Lite was quickly pushed out of the marketplace by more reliable phosphorescent 'Magic Eye' tubes in the 1930s, and few functional examples survived to the present day.